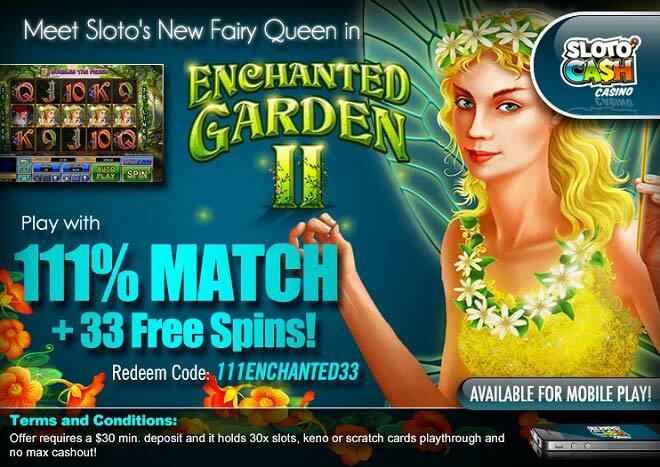 Wings and a magic wand have turned a simple girl into Sloto’s official faire and thus you’ve found your favorite new online slot machine: Enchanted Garden II. Get lost in a world of whimsical wins when you make a deposit of as little as $30 that opens the doors to a 111% Match plus 33 Free Spins. Part two of our already successful and ultra popular Enchanted Garden slot can be played from your computer or preferred mobile device. Visit Enchanted Garden II and travel to a garden of 5 reels where fairies and gnomes have made their home. And the wins aren’t scarce with help from bonus features, free spins, multipliers and more. Land the Garden icon in the first reel with a Fairy Princess on the last one and you’ll be collecting free spins with enchanted multipliers. Fireflies, fairy queens and other magical creatures award even more free spins and winning chances!